Today’s dressgasm is so stunning exclusively because of the unique design of the extended points from the bodice and the flattering draping of the skirt. 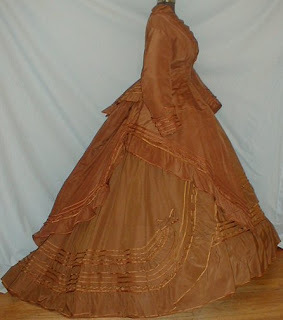 I found this dress in an eBay listing this morning from one of my favorite sellers of antique garments. This dress dates to the mid-1860s from my estimate. 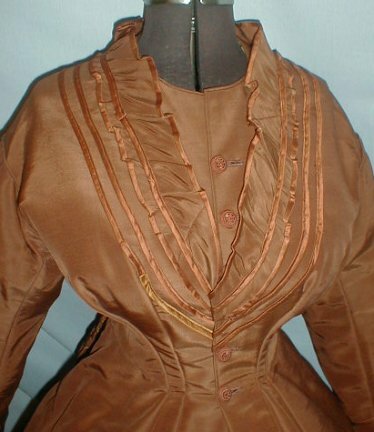 If I had to put a year on it, I would say 1864 or 1865, possibly even 1866, based on the draping of the skirt and the cut of the bodice. 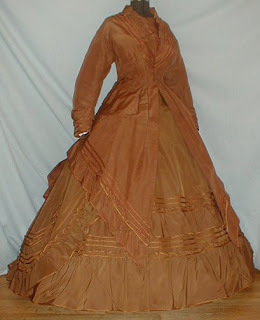 The width of the skirt suggests Civil War but the cut of the dress looks like a precursor to the bustle dresses of the 1870s and 1880s. It’s a silk and wool blend in a copper color that becomes gold when the fabric is hit by different light. Bronze satin ribbon lines the drapes and ruffles on the skirt and bodice. A woman wore a “visiting dress” when she did just that — visited her friends and family. As I wrote in an earlier blog post, wealthier women had different dresses for a myriad of different purposes not only for functionality but to put her social status on display. A certain portion of the day would have been reserved for opening the house so a woman could receive guests. The woman who wore this dress did so when she was out visiting people that she probably wanted to impress. If you made a call on someone who wasn’t home, then you could leave your calling card and that way, the friend or whomever could answer you with a note later or invite you back another day. This was such a lovely dress that the lady might have thought about having her photograph made in it. When you had a photograph made, you wore your better clothes because it was considered a special occasion. >Wow. wow wow wow wow. wow. >What a gorgeous dress. I love the color! So pretty! !